Cambodian mothers and grandmothers behind bars after facing off the most powerful men in the region. Will the World Bank stand by them? Last week thirteen Cambodian women representatives of the Boeung Kak Lake community were sentenced to two-and-a-half years in prison after a summary trial. The women, including a 72-year old grandmother, were arrested on May 22 whilst singing at a peaceful protest to support 18 families whose homes had been buried in sand by a private developer (view the video). The arrest, trial and sentencing took place within 48 hours, with no time for the women’s lawyers to prepare a defense. During their trial, the police arrested two more community representatives who were waiting outside the courthouse prepared to testify as witnesses for the 13 women on trial. The women, who call themselves the League of Boeung Kak Women Struggling for Housing Rights, have waged a multi-year battle to defend their homes and land in the bustling center of Phnom Penh. Their campaign has included everything from publicly burning effigies to rid the city’s authorities of evil spirits to baring their breasts at demonstrations to display their desperation. It has also involved a sophisticated legal advocacy strategy, including the submission of a complaint to the World Bank’s Inspection Panel, an internal watchdog mandated to investigate alleged violations of the Bank’s operational policies. 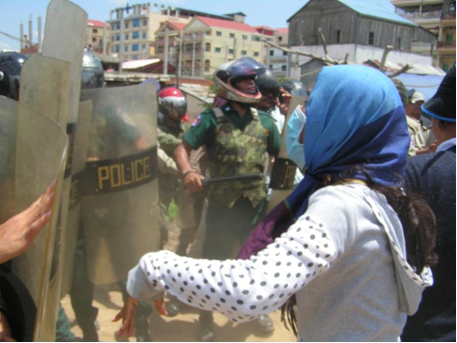 The women’s family homes were being threatened by one of the wealthiest and most powerful Cambodian tycoons, who is also a ruling party Senator, backed by China’s Inner Mongolia Erdos Hongjun Investment Corporation. In early 2007, Senator Lao Meng Khin was granted a 99 year lease over 133 hectares in central Phnom Penh, which covered Boeung Kak lake and its surrounding villages, home to some 20,000 people. The lease was granted for a mere $79 million US dollars, a fraction of the estimated $2 billion value of the property. Soon afterwards, the company began filling in the lake and coercing its denizens to leave the area for a measly sum in compensation. Attempts by the community and civil society advocates at persuading the Senator’s company and the government to stop the mass forced eviction appeared futile. They remained impervious to the outcry against what threatened to be the biggest single mass displacement of Cambodians since the Khmer Rouge emptied the cities in 1975. Then in mid-2009 a single piece of information came to light that dramatically altered the course of events. Right around the time that the Boeung Kak lease was granted, the entire neighborhood was wrongly excluded from a World Bank-financed land registration program. Had their claims to the land been adjudicated, in all likelihood, most of the residents would have been found to be legal owners of their plots. Instead the entire area was dubiously marked in a way that allowed the State to claim it and issue the lease to the Senator’s company. This unlawful move and the related forced evictions were ignored by the World Bank in its routine supervision missions, despite the use of a Bank funded program to formalize an illicit land grab. The Inspection Panel investigated the case upon the request of Boeung Kak residents, and its report, released in March 2011, concluded that the Bank’s non-compliance with its operational and safeguard policies contributed to the “grave harm” the families faced through forced eviction. Seizing upon the vindication of their multi-year campaign by a quasi-judicial body, the indomitable League of Boeung Kak Women sent a letter directly to World Bank President Robert Zoellick. The women urged him to act on the Panel’s findings and do everything possible to persuade their government to stop the mass forced eviction and negotiate with the residents to find a mutually beneficial alternative. The result was unprecedented. After a fruitless yearlong effort to engage the Cambodian government in resolving the case, in May 2011 the Bank took the unusual step of suspending all new lending to Cambodia until an agreement is reached with the residents of Boeung Kak lake. This bold decision had important implications, both within Cambodia and institutionally. It sent an important signal to all World Bank member states about the sanctity of policies intended to protect people and the environment from harms resulting from Bank-financed projects. And it sent an important signal to the Cambodian government that it is not acceptable to sacrifice the rights of the few in order to provide development benefits to the many. It also appeared to work. Within a week after this lending freeze became public knowledge, in August 2011 Prime Minister Hun Sen issued a decree granting title to most of the remaining families over their land in the Boeung Kak area. This marked a significant human rights victory in Cambodia. Thousands of people who were facing the prospect of forced displacement and impoverishment, for the first time have formal legal security to their homes and land. Moreover, in a country where powerful people routinely act above the law with impunity, and poor and marginalized people have no access to justice, ordinary Cambodian families were able to access an impartial accountability mechanism and obtain a just and meaningful remedy. Although the Bank’s decision was undeniably only one contributing factor to the outcome, it was critical in both laying down the law and vindicating and empowering the community. Despite this considerable victory, the case is by no means closed. At least 94 families have been excluded from the land concession, and over the past few years, more than 3000 families – the vast majority – were displaced from their homes in the Boeung Kak area after accepting inadequate compensation under extreme duress. These families are not benefiting in any way from the Prime Minister’s decree and many have been impoverished as a result of the eviction. The community has remained admirably unified in its quest for a resolution for all residents and former residents, despite some families already having secured their land rights and the serious risks of retaliation that has now landed them behind bars. Sadly, with President Zoellick stepping down in June, the regional management of the Bank is indicating that they are ready to put this uncomfortable episode behind them and get back to business in Cambodia. If such a move is made without restitution first being provided to the displaced Boeung Kak households, this would likely ensure that these families never see a remedy at all, and an all-too-rare example of World Bank accountability would be squandered. It would be a huge slap in the face to the women now languishing in Cambodian prison cells in order to bring justice to their community and country. Lets hope that Mr. Zoellick and his successor, Jim Yong Kim, wait for a more judicious moment for re-engagement. At a minimum, they should ensure that Boeung Kak’s brave human rights defenders are released from prison and that the displaced families receive their just entitlements before authorizing a resumption of lending to Cambodia. On 30 May a letter signed by more than 100 organisations from Cambodia and around the world was sent to President Zoellick and President-Elect Kim appealing to them not to lift the lending freeze on Cambodia until a comprehensive agreement is reached with all Boeung Kak residents and former residents, and the 15 human rights defenders are freed. David Pred and Natalie Bugalski are co-founders of Inclusive Development International. They co-authored the complaint to the World Bank Inspection Panel on behalf of the Boeung Kak community. They both spoke at this Castan Centre event on an Asian Development Bank/AusAID development project in Cambodia, held in Melbourne in February 2012. This article first appeared as a post on the TerraNullius blog. Guest contributors regularly write for the Castan Centre blog. We choose guests who have a high level of expertise on the subject matter in question. Whenever we feature a guest blogger, we include their name at the top of their post and a brief bio at the bottom. grandmothers behind bars after facing off the most powerful men in the region. Will the World Bank stand by them? | Castan Centre for Human Rights Law”, will you mind if perhaps I utilize several of your own ideas?